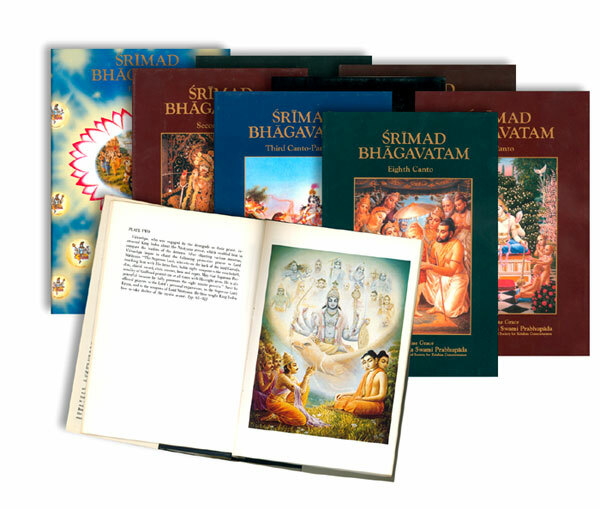 Srimad-Bhagavatam begins with the definition of the ultimate source. It is a bona fide commentary on the Vedanta-sutra by the same author, Srila Vyasadeva, and gradually it develops into nine cantos up to the highest state of God realization. Canto 2: "The Cosmic Manifestation"
Canto 3: "The Status Quo"
Canto 4: "The Creation of the Fourth Order"
Canto 5: "The Creative Impetus"
Canto 6: "Prescribed Duties for Mankind"
Canto 7: "The Science of God"
Canto 8: "Withdrawal of the Cosmic Creations"
Canto 10: "The Summum Bonum"